In opening his new restaurant at the expanded SFMOMA, called In Situ, chef Corey Lee explained that he and his staff would "performing" the work of other chefs around the world, interpreting their recipes as they'd be served in those chefs' restaurants, spanning a period of roughly the last 20 years in culinary history. It's a novel approach to a modern museum restaurant, one that draws on both the rise of foodie culture and the hero worship of chefs, and on the concept of a museum, displaying the works of many artists. Food, especially at the high end, has long been considered an art form, albeit an ephemeral one, and chefs have always riffed upon  or outright recreated, sometimes with credit  each others' dishes. But never before had a chef opened a restaurant in which he specifically intended only to feature the work of others. The New York Times' Pete Wells was curious enough that he flew to San Francisco and had a recent lunch there, calling In Situ "the most original new restaurant in the country." And Lee did this, Wells says, "by avoiding originality." He notes that the management makes comparisons between the broad-ranging, eclectic menu of various hits of modern cuisine and "an art installation"  and Lee has compared the recreation of the dishes to a choreographer reinterpreting another choreographer's work years later. But Wells observes that the experience is more like listening to a playlist ("A new dish would come to the table, and I’d get into it, and then it would end and something new would start. Being unconnected to one another didn’t seem to hurt the dishes; if anything, they gained something from the surprise of each new segue."). I had a similar experience at a Friday dinner, with a parade of inventive, delightful, totally disjointed dishes that were all equally delicious, each lending its own voice to the overall meal. This is clearly a kitchen that is operating at the highest level in trying to do justice to the work of renowned chefs like Sean Brock, Andoni Luiz Aduriz, and Thomas Keller, and the seemingly effortless execution of each dish belies a complexity of technique and an array of individual components that would probably make the average cook throw up their hands. 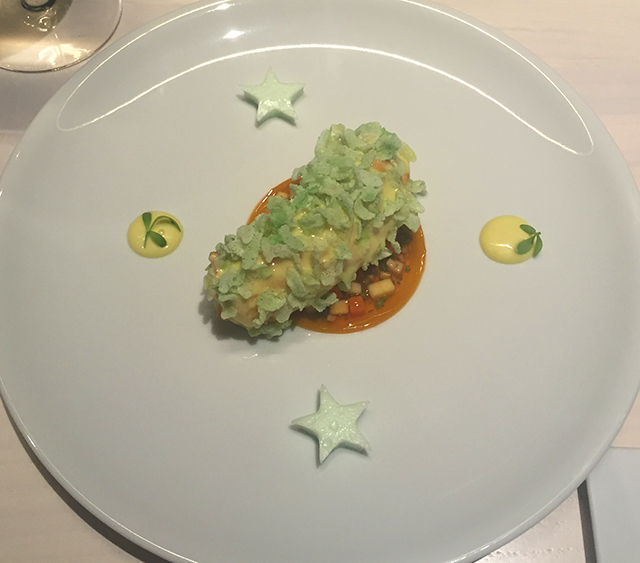 Take for example the Wasabi Lobster (Tim Raue, Restaurant Tim Raue, Berlin, 2013, $22), a dish of lobster tail served beneath a pungent, tangy and spicy wasabi Hollandaise with a Thai vinaigrette, mango jelly, wasabi rice crispies on top, and two wasabi marshmallows  which, our server explained, were included in celebration of the Restaurant Tim Raue earning its second Michelin star in 2013. Wasabi and lobster are two flavors I could honestly say I hadn't had paired before, and here was a dish from a single point in time from Germany that was entirely Asian in its influence, but fun and delicious, with the lobster perfectly tender and the sauces impeccably made  all told a pleasantly sinus-clearing way to begin a meal. Next we traversed the globe to Sean Brock's Husk restaurant in Charleston, South Carolina, and a dish he served in 2009 that helped put him on the map  the restaurant would ultimately get a Best New Restaurant honor from Bon Appétit in 2011. It was an interpretation of a low-country Southern dish, smoky brown oyster stew with bacon, served with benne seed and "Charleston ice cream"  not ice cream at all but creamy, risotto-like rice that scoops like ice cream. 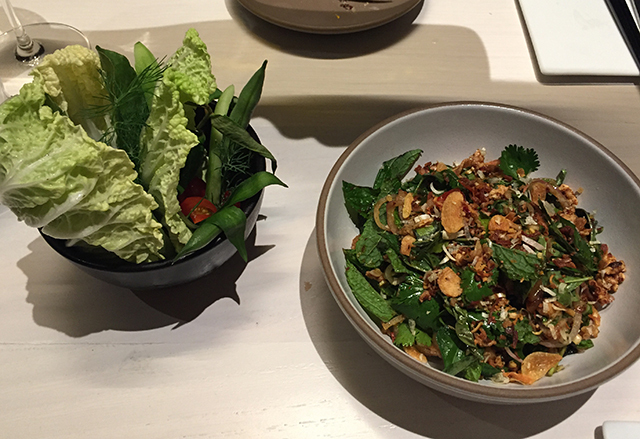 It was a homey, deeply satisfying dish that was only dissatisfying in its portion size  while being a high-end interpretation of homestyle flavors, it was so good that I wanted a huge bowl of it, and at $28 the petite serving seemed frustratingly small. But as Thomas Keller has always taught, via the law of diminishing returns, in fine dining you always want to leave a diner wanting more, at least until they're full. Chef David Thompson's guinea hen Chiang Mai larp (Bangkok, 1999). The next succession of dishes took us to Thailand, where we had a very spicy, incredibly flavorful interpretation of authentic Thai larp ($24), made with diced guinea fowl and loads of chilis, crisp-fried shallots, peanuts, basil, and mint, created by Australian chef David Thompson at his Bangkok restaurant Nahm in 1999. Luckily prior to blowing our palates on that, my friend and I shared chef Hisato Nakahigashi's Umami Soup ($38), from his Kyoto restaurant Miyamasou in 2015  a rich, layered, subtle, and truly great broth with udon noodles and miso-marinated Wagyu beef. 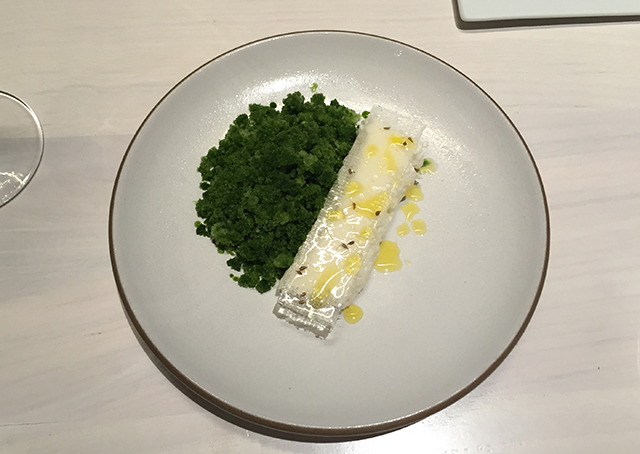 For dessert, we hopped to Scandinavia, to a 2005 classic by Rene Redzepi of the famed Noma in Copenhagen, a subtly savory dish of wood sorrel granita served alongside a sheep's milk yogurt mousse. Redzepi's wood sorrel and sheep's yogurt dessert (Copenhagen, 2005). No dish felt out of whack or slipshod, and much the way the galleries in the museum upstairs encourage a kind of quiet reverence for iconic 20th Century paintings, equally high respect was paid to each. And much like a gallery, the featured works will be in flux throughout the year: The restaurant has reportedly already swapped dishes out and changed the menu five times in its first six weeks in businesses, with incremental changes planned on a revolving basis based on seasonality and ingredient availability. But after a bottle of wine and service included, this was a dinner for two that crossed the $300 mark, and even in contemporary San Francisco there's will be sticker shock on some of these dish prices. Also, if you're hungry, you will need five to six plates, and at $25-$38 apiece, that adds up fast. After all, these are dishes that were originally designed for tasting menus that probably started at seven dishes and may have been as many as 20. And the design, while sleek and expensive-feeling, with custom furnishings and whole-log hewn communal tables in the front lounge, feels sterile and way over-lit  the lighting level is more museum gallery than restaurant, and the experience suffers for it, even if your Instagrams of the food won't. A note about that front lounge: It remained entirely deserted the Friday night I was there, which seemed odd regardless of the restaurant's newness  and especially after the NYT review. Part of that may be that the space itself doesn't feel very inviting  without a bar area to energize it, it feels like a large, empty, architect's waiting room looking onto the street. Also, the lounge menu, available both day and night, while certainly unique as bar menus go, varies from small portions of Roy Choi's ketchup fried rice and Isaac McHale's buttermilk fried chicken with pine salt, to a $32 grilled cheese sandwich with Saint-Nectaire cheese and black truffle (Pascal Barbot, Astrance, Paris, 2011). Like the main menu, it may be fun for a one-time thing with a pricey glass of wine (most hovered in the $18-$20 range), but it isn't exactly begging for regulars to hang out after a workday. Dining, reading about star chefs, and dabbling in the food world's highest echelons, have become cultural and entertainment experiences of their own in the last two decades, and that was Lee's notion in creating In Situ. Most of us do not have the time or resources to jet around the globe just to dine at most of the places represented on this menu, like the obsessed and lonely seeming people in this 2013 documentary. And most of these chefs do not take their shows on tour, like museum exhibits  you have to go to them. So no doubt, Lee may have created a concept with In Situ that will be imitated in the coming decades as more ravenous foodinistas demand such things. But it remains to be seen if a place this refined, exacting, and necessarily expensive will hit a lasting groove, or if its urbane audience will have their fill after just a few bites. In Situ - 151 Third Street at Howard, inside SFMOMA - Open daily for lunch, 11 a.m. to 4 p.m., and for dinner Thursday to Saturday from 5 p.m. to 9 p.m. In order to write a full review, expenses for this meal were paid out of pocket. SFist editors and contributors will typically pay out of pocket for food, though for budgetary reasons will occasionally accept complimentary meals from restaurants and their publicists, and therefore can not guarantee anonymity. Tim Raue's Wasabi Lobster (Berlin, 2013).